It must annoy McDonald's no end that their car park is almost exclusively taken up with taxis and limos so punters can't park to get food. 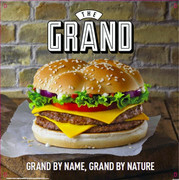 The Big Mac grand is some serious burger. If the lads in the kesh can join the virtual queue from the real one they could artificially boost the numbers in line to a few hundred on the system making it look pointless to bother waiting.. It's a grand burger, JM... had one with bacon myself a couple of weeks back... a rare treat for me these days as I don't want to exceed 17 stone again... mind you, when I'm withering away on my death bed I'll probably be wishing I was the size of the erm! Is that what it’s called. Had one a few weeks back with chips and drink. Looks like a Whopper in the shape of a big mac to stop them getting sued.. It tastes like a Big Mac though, MfH. That Big Mac sauce is unique to McDonalds. I think they do have a Whopper clone though, might be called Big Tasty? Ah ok.I think the mac sauce is like a mayo/ketchup blend.I think one of the big brands like Heinz got close to replicating it and selling it under another name. But it's not a Big Mac. It is, in my opinion. I think the Kesh is excluded from the Zone, I was reading that Kelly’s car park is also excluded. Maybe that the big thing MyTaxi are going after. They can turn to DAA and say if we do 1 pick up every minute over 13 hours, thats 780 jobs, just from the airport and if every taxi pays €1.50 each time, that’s €1,170 in car park charges per day, that’s €5,850 a week, and 304,000 a year!!!!!!!!!!! And the drivers are supposed to pay the parking fees and not the customer, even thought every other app allows you charge that fee. How many kesh permits is there? Paying €440 a year. Which would the DAA prefer?? The car parking charge is 100% on you.If you charge it,you are breaking the law. That’s akin to saying we cannot charge Tolls.